It was a big day yesterday, thanks to the Fed. This morning the Jobless Claims numbers beat expectations when they came in at 291K vs. 294 expected but this isn't the news. The news happened yesterday when there were two changes in how the Fed communicated their message. The change that could have been bad for rates was when the Fed removed the word "patient" from their stance on when they are going to start raising the Fed funds rate. This means that we may see it as soon as June where as before the consensus was probably more like the fall. Fortunately the Fed also said that the see "moderate" growth in the economy which was a change from "strong" growth. As you've read on my blog, there has been a lot of mixed data over the last several weeks and many key data points have been weak. 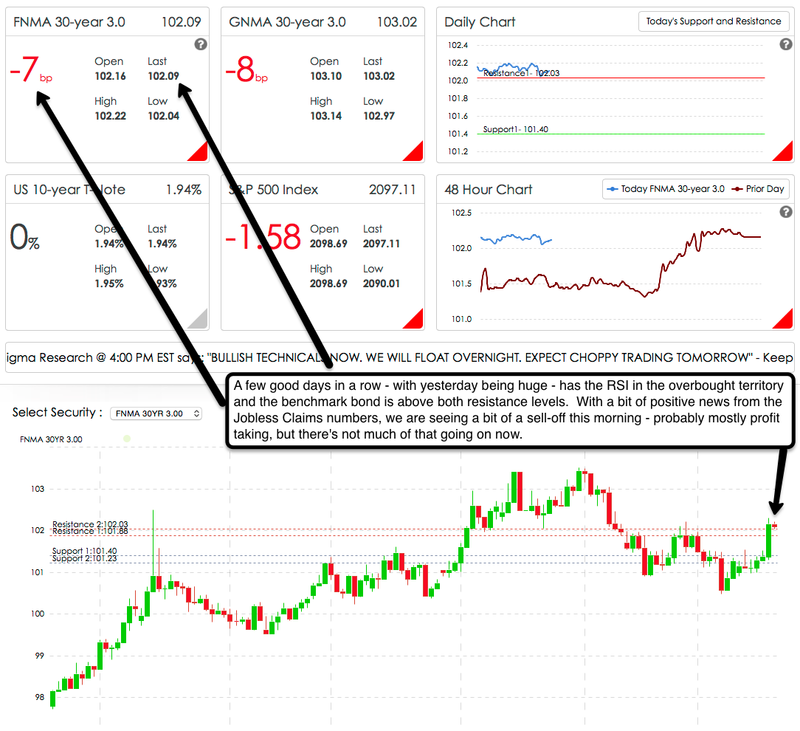 I think the traders focused on this comment when deciding to buy bonds very enthusiastically, pushing the FNMA benchmark bond up 78 basis points by the end of the day yesterday. Continuing the theme of more mixed data, the Philly Fed Manufacturing Survey came in at 5.0 this morning vs. expectations of 6.9. While this is a big miss, it appears traders are focusing more on the technicals I mentioned above as the FNMA benchmark bond is currently down 15 basis points. My recommendation is that if you have a loan closing in 15 days, I would lock and take advantage of the recent price gains. If you have a loan that is closing more than 15 days out, you can float with caution - just make sure you keep a watchful eye on the market and be ready to lock if there are any sudden big moves in order to try to beat a reprice. The NCAA basketball tournament starts today - I've got a number of brackets filled out and will be working in front of my TV virtually all day today. Please feel free to call me if I can help you with anything mortgage-related. Make it a great day and if you're a sports fan, enjoy the tourney.